This has been one helluvan eventful weekend indeed! And yes, Tiger has been in the middle of it all as well. There are just 1411 left, the hoarding claims, and today's papers spoke of 2 more that succumbed. So, 1409 pieces of our National Animal! I just wonder. If this is the fate of our national animal, what could be the fate of all other species in India? Hoardings, TV ads scream out - 'SAVE THE TIGER'. 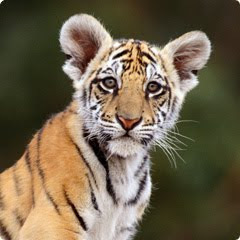 The idea is to spread awareness amongst our people, about the plight of the tiger. But you know what? Those who need to know, know. The poachers know that the numbers are dwindling. But Chinese medicine demands a killed, mutilated tiger. And how does it matter? Some random animal is killed for medicine. After all, a human being would be cured, only to go on and pillage the environment further. Ok, I may sound harsh. But there are always alternative routes to co-exist, right? If Chinese medicine exterminates a species in totality, tomorrow, this same tiger-parts driven cure would need to move to something else. Why not move to that something else before Stripey loses its mom? But I guess, we can blame this on the very nature of humanity. I allude to the movie Avatar - (pop culture drives points across more effortlessly). So, the huge red bird, in the movie is a predator and slays the smaller birds, which are the Navi peoples' mounts. So, the princess makes a comment, that the red bird never looks up, since it is never the prey. And this point is used by our hero to tame the red bird and win the peoples' respect as the movie pulls on. So, my point is, that the human race has never been plundered and preyed upon by a more superior species. And yes, this feeling of invincibility has made us nonchalant towards others we share our environment with. Every other entity is inconsequential in the human side of things. And unless something comes to sting us personally, we don't bother about anyone else. Tomorrow, if an arcane tribe develops a medicine for H1N1 or HIV, that needs human liver oil, I wonder about the consequences! I guess, you're right indeed. But children's book writers can have a field day with central characters revolvong around tigers, since anyway, by that time, tigers would be mythical creatures that once roamed the world!! !